For want of something better, here is a list of what is going on, or more appropriately what is not going on around here. My blasted sore throat has returned with a vengeance. It had more or less abated for a few days after lingering since Christmas. Actually, the throat is beginning to abate, and a cold is emerging. This is how colds and flus begin with me — with a sore throat. Sue opines that this cold is down to me. Usually the kids bring illnesses home, but I am the only one under the weather this time. Speaking of the weather, it is so changeable lately. It was frigid last week with temps going down to -40 on either scale. Now, it's snowing, but we can expect both rain and freezing rain in the next few days. Freezing rain is the worst. Due to the weather, we have been more or less hibernating. We attempted a walk in the park on the weekend, but it was so icy and slippery that we soon turned back. Since Christmas or very close to it, we have watched all ten seasons of the British drama, MI-5. We watched on Netflix. Try it if you can. Season One was a bit slow, but the series took off soon after. We have just begun watching The Hour, another British series, but it is only six episodes long. I just started reading, The Price of Stones, my third consecutive non-fiction. The first two had to do with religion. I discussed the second was, God's Problem by Bart Ehrman on my previous blog post. But wait ... I forgot there was a fictional piece after Ehrman's book: An Unknown Grave by Charles Todd: a Bess Crawford mystery set in WWI. She is an army nurse but has military connections through her colonel father. These connections are helpful in the solving of mysteries. The Price of Stones is Twesigye Jackson Kaguri's biography of building a school for AIDS orphans in Uganda. It was co-authored by Susan Urbanek Linville. I think it will be a good follow-up to God's Problem, as it is one person's efforts to help alleviate suffering and provide a better life for the orphans. Speaking of books, I received a Photoshop book last week. It was on a topic that I want to know more about, so I ordered it online. I think it's terrible and wish to exchange it. Apparently, they will do this, but still, I ordered the book, and they delivered it. So perhaps I should just live with it? Hmmm. The NHL is back after the lockout. It's nice to be distracted by the occasional hockey game on tv. Actually, right now I can be distracted as much as I want because NHL pay tv is free for a little while, and I could view multiple games on any night. I don't, of course. The free month is a sop to the fans for the irritation of the lockout. So, as you can plainly see read, life is pretty dull during our winter hibernation. One more deadly winter month to go before we begin to get some improvements. Just for something different, I thought I'd post about my most recent read. As the graphic to the left indicates, the book in question is God's Problem by Bart Ehrman. Ehrman is a former evangelical believer and minister who now labels himself as an agnostic although he teaches New Testament studies at the University of North Carolina. I rather delight in reading Ehrman who is able to reveal much of biblical matters in a straightforward way to ordinary plods such as myself. It takes talent and application for an academic to write so lucidly for the ordinary Joe. It was the question of suffering that ultimately drew Ehrman away from the faith, and it is that issue that he tackles in God's Problem. In God's Problem, he explores various biblical explanations for suffering, beginning with the ancient Hebrew prophets for whom suffering was a punishment directly from the hand of God to his disobedient and wayward people. And so, the early Israelites were overrun by Assyria and Babylon and carried off into exile and slavery. It must be said that much of God's anger was against the powerful of society who abused the common and poor. Of course, the ordinary folk were also brutalized and carried off into slavery when Israel and later Judea were conquered. On the other hand, sometimes in the ancient texts, suffering served a redemptive purpose. Such was the case of Joseph, who was beaten by his brothers and sold into slavery but in the end was able to save his family from starvation. He then turns his attention to two books of wisdom in the Old Testament: Job and Ecclesiastes. According to Ehrman, Job is two books fused into one. The two books (or sections) have different answers to suffering, which maybe is why I could never quite relate to Job. In one book (or in part one of Job), God tests Job to see if he's faithful. In this section, Job is compliant and passes the test. In the other section, Job rails against the way that God has treated him. That section ends with God being angry and declaring, in effect, that he can do whatever he pleases just because he is God. That's my pathetic Q&D summary of Ehrman's, God's Problem, but I would like to say in passing that I learned a lot about the scriptures in general. I think I have a much better understanding about a number of including apocalypticism, Job, and the background to the writings of the prophets. I must say that Ehrman is not highly polemical in this book, as much as my poor summary might sound like he is. He's not really trying to convince the reader of his views at any cost, if at all. He explains what he believes and why the various biblical reasons fall short in his view, but he doesn't bludgeon the reader to accept his conclusions. The book is primarily an overview of what the Bible says about suffering and only secondarily what Ehrman thinks of the message. I think that I learned a lot about the scriptures in addition to reading Ehrman's personal views about the problem of suffering. I hadn't planned on reading God's Problem because the issue of suffering hasn't been a major theological source of angst for me (although perhaps it should have been), but since it was there on the library shelf as I was browsing and, since I had read and appreciated Ehrman previously, I picked it up, and I'm glad that I did. In closing, I would like to include three paragraphs from very near the end of the book, for I think they give the flavour of the man far better than my own words. I'll bet there's a whole lot there with which most people of any religious or political persuasion can agree. I have to admit that, at the end of the day, I do have a biblical view of suffering. As it turns out, it is the view put forth in the book of Ecclesiastes. There is a lot that we can't know about this world. A lot of this world doesn't make sense. Sometimes there is no justice. Things don't go as planned or as they should. A lot of bad things happen. But life also brings good things. The solution to life is to enjoy it while we can because it is fleeting. This world, and everything in it, is temporary, transient, and soon to be over. We won't live forever — in fact, we won't live long. And so we should enjoy life to the fullest, as much as we can, as long as we can. That's what the author of Ecclesiastes thinks, and I agree. In my opinion, this life is all there is. My students have difficulty believing me when I tell them that that's a view taught in the Bible — but it is. It is explicitly the teaching of Ecclesiastes, and it is a view shared by other great thinkers, such as the author of the poetic dialogues of Job. So maybe I'm a biblical thinker after all. In any event, the idea that this life is all there is should should not be an occasion for despair and despondency, but just the contrary. It should be a source of joy and dreams — joy of living for the moment and dreams of trying to make the world a better place, both for ourselves and for others in it. This means working to alleviate suffering and bringing hope to a world devoid of hope. The reality is that we can do more in dealing with the problems people experience in our world. To live life to the fullest means, among other things, doing more. There does not have to be world poverty. The wealth could be redistributed — and there would still be enough for plenty of us to be stinking rich. Even on a microlevel, we could distribute some of our wealth (I'm not calling for a Marxist revolution). There don't have to be people sleeping on the streets in my city of Durham. Children really don't have to die of malaria; families don't need to be destroyed by waterborne diseases; villages don't need to die of massive starvation. Children don't have to face the prospect of going to school without a healthy breakfast. A living wage for everyone doesn't have to be just an idealistic vision for a group of wide-eyed liberals. The nation doesn't have to spend billions of dollars on wars it cannot win to empower regimes that cannot survive. With the weather continuing to be problematic, I decided to work on some post processing skills rather than photo-taking skills. 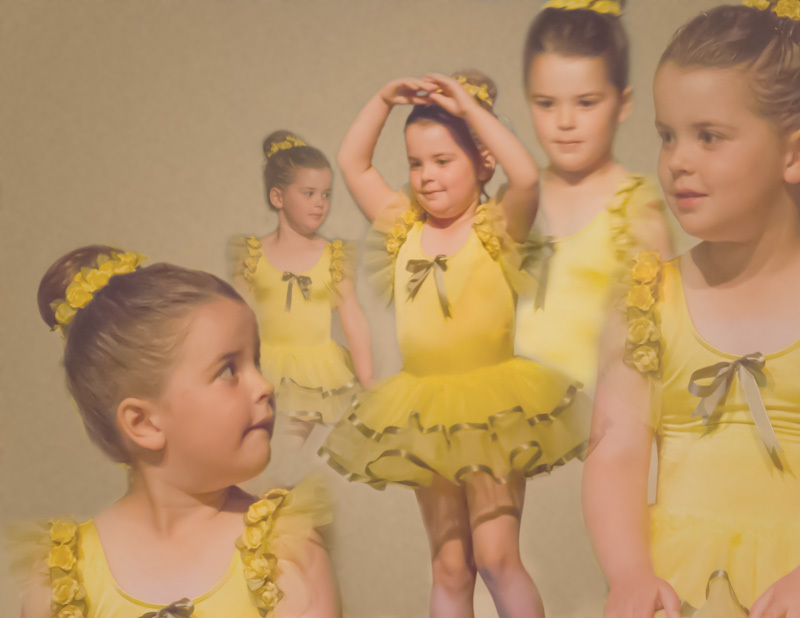 You may recognize Danica from her spring dance recital in these photos. I decided to make a collage from several of them. Speaking of Danica, we had her for a sleepover on Friday night. I was staying slightly removed from her because I felt flu-like and didn't want to infect her. As it turned out, however, she was the one upchucking all night. She was also very toned-down the next morning and not her usual exuberant self. Meanwhile, the wind is howling out there, so I will remain in here. We will watch another episode or two of MI-5, and I will likely read more about God's Problem, a book on suffering by Bart Ehrman. He is an excellent writer who is able to write lucidly on Biblical topics. I say lucidly because it is a gift for an academic to write with such clarity for the ordinary bloke such as myself. We are presently settling into winter after the Christmas season. At halfway thru January, we still have a long way to go, for it will be winter until the end of February at the least. 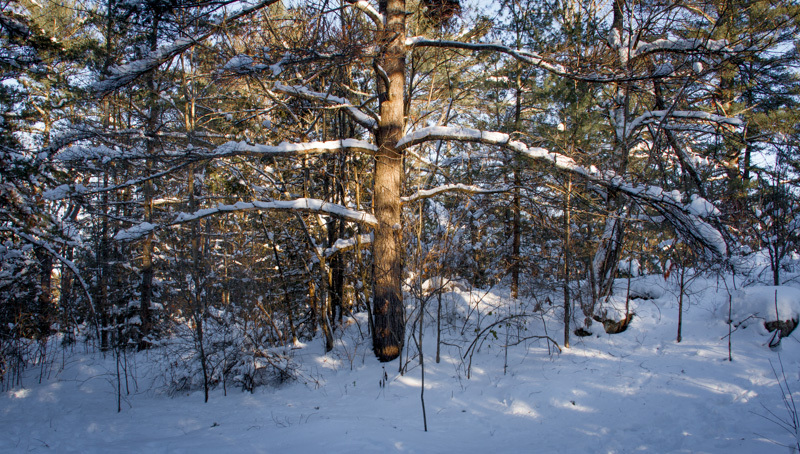 Sometimes, winter lingers until mid-April as unusual as that may be. In a good year, we will notice improvements in March: improved weather mixed with periods of regression.Last March, if memory serves, we had a ridiculous warm spell in January that started the plant going early. When the inevitable frosts came, many tree crops were lost. We had about three weeks of a fair amount of snow around Christmas. 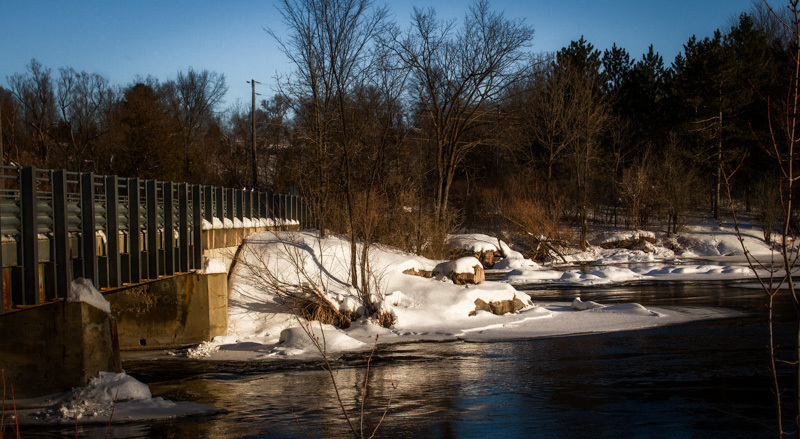 Lately, we have been experiencing our usual January thaw with mild temperatures and quite a bit of rain. Despite all of the melting, the snow is still piled deeply where it was thrown with the earlier snow removal. At a certain point in this region, the snow stays all winter no matter how warm the weather gets. Anyway, the main benefit of the recent mildness has been that the streets thawed. They have been rutted and atrocious to drive on for almost a month now. The next weather wave to hit us will be a cold spell although we may not go into a huge freeze. What all of this means is that we are mostly confined indoors these days. We wanted to take JJ tobogganing as we did his sister a week or two ago, but I think we'll have to wait for more snow, which is not in even the long range forecast right now. 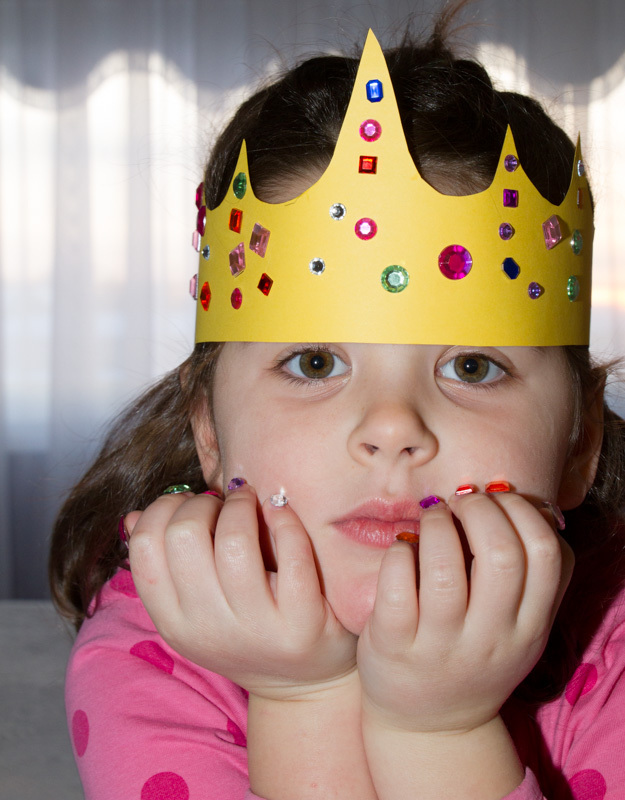 Last week, JJ made a crown at Storytime, and Danica felt hard-done-by when she got home. 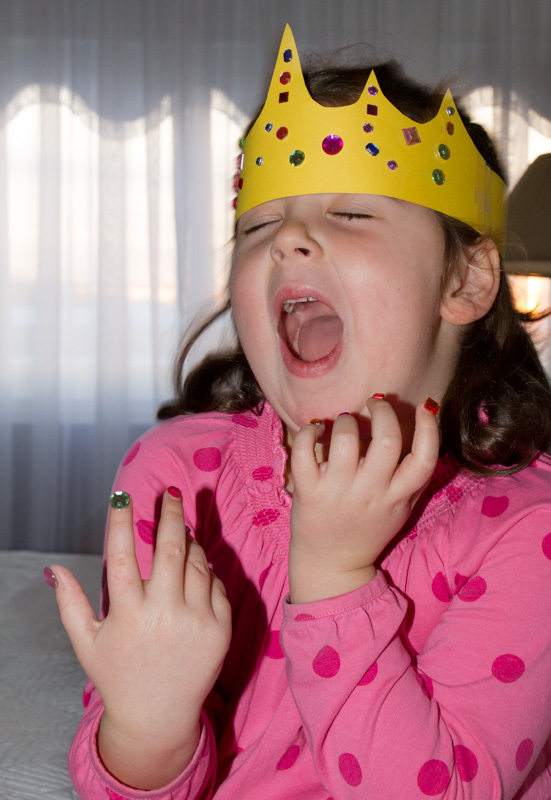 So, Amma helped her to construct quite a jeweled crown the next day. As you can see in the photos, she also had her nails done. 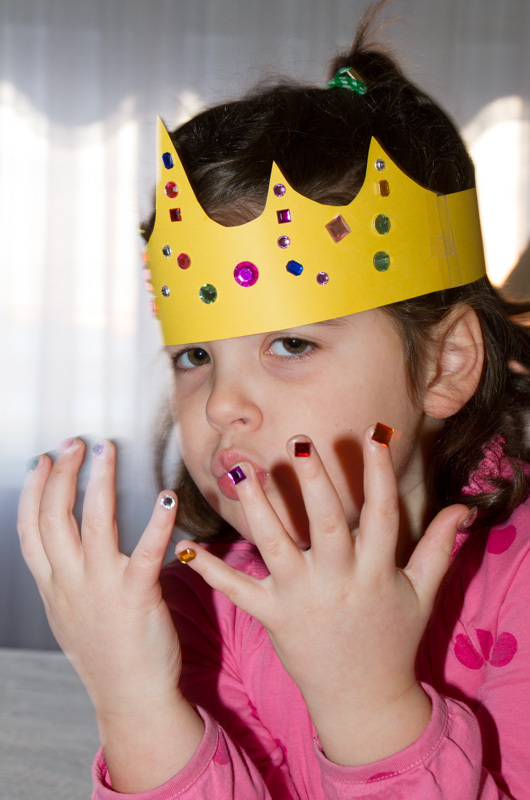 no wonder Mom calls her, "My Girly Girl." I'm so happy with myself. Remember when I wouldn't pose for the camera? AC continues to be a bad blogger by neglecting this place a lot lately. We are more or less done with the viruses that affected the family over Christmas. 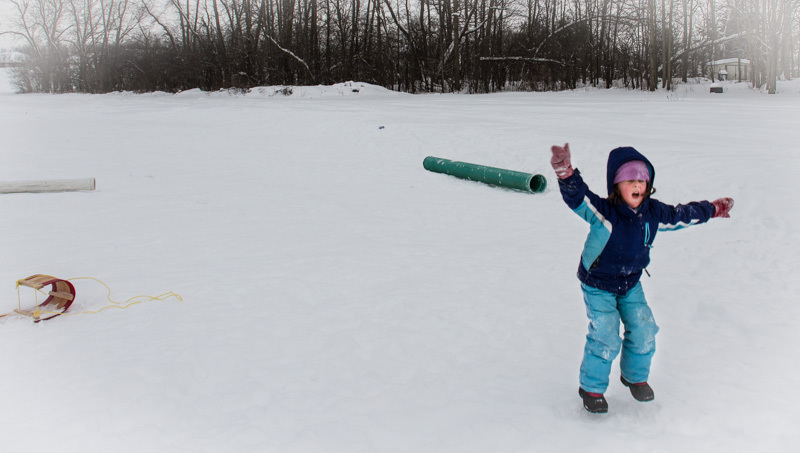 Danica has settled back in to school, and winter continues to hold sway in these parts. I have had a number of minor health issues. There was some worry that they were linked in some way, but they were in fact simply a number of unrelated conditions. Well, there is one common factor, that being that I am 65 and various things happen in various bodily places. It seems that the ticker is fine all things considered, so other things can be dealt with, even if the "dealing" just means living with the inconvenience. We spent much time in two different hospitals yesterday, and the two issues of concern were pronounced minor, so I am happy enough to be left to deal with the usual trials and tribulations of life. I mentioned above that we are having quite a winter here. We have had quite a bit of snow, which I rather like if truth be told. For my taste, a snowy winter beats an icy or slushy one. Naturally I have pictures to share. These are from Blakeny a little corners with a bridge and conservation area that we visited for a little while last Saturday. I find that those more milder climes often fret about the cold when I post winter photos, but the odd thing is that when we dress properly for the weather that we are generally comfortable. Mind you, we are wise enough to stay indoors during the worst weather. 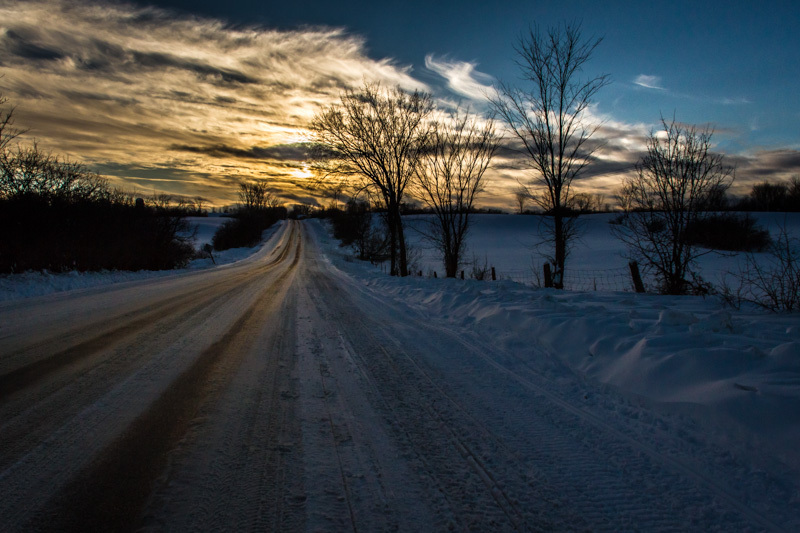 Winter can be both beautiful and invigorating. I guess I am entering the winter of my life or close enough to it and any rate, and I still find reasons to enjoy life. The Mississippi River is in the foreground and the bridge over it to the left. 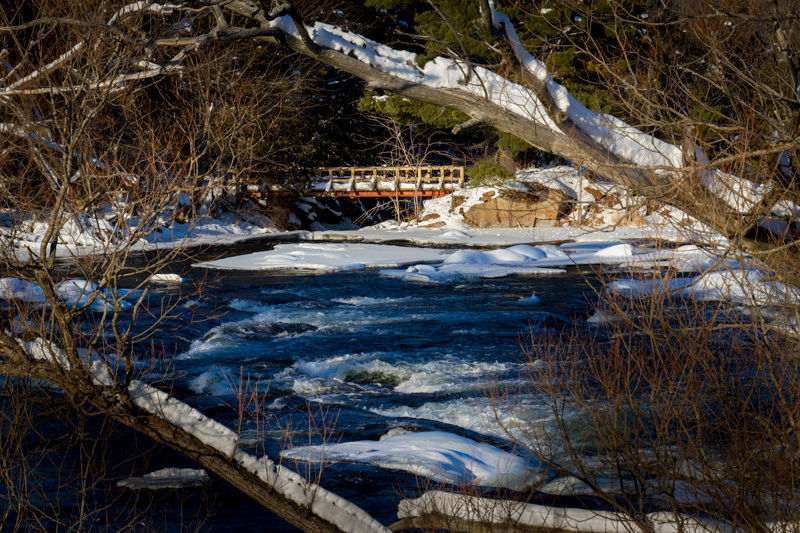 This is taken from the road bridge and looking into a foot bridge within the conservation area. 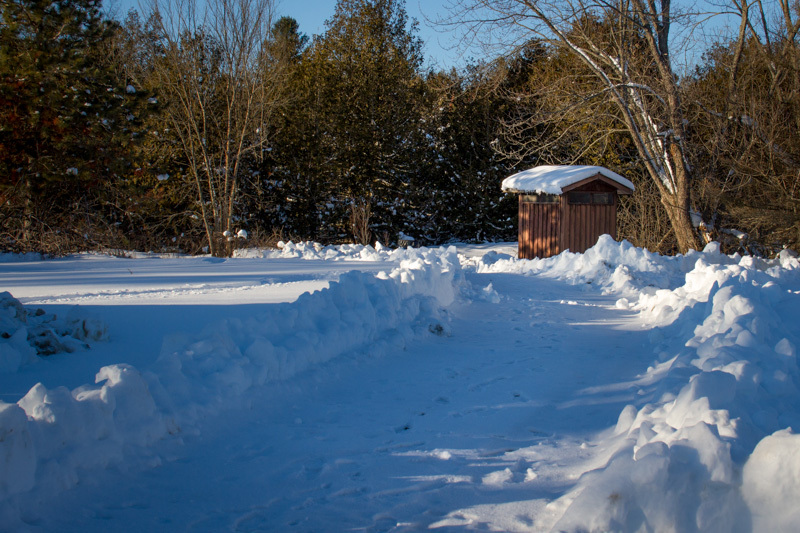 The entrance to the conservation area was plowed as far as the outhouse, which was actually open for use. 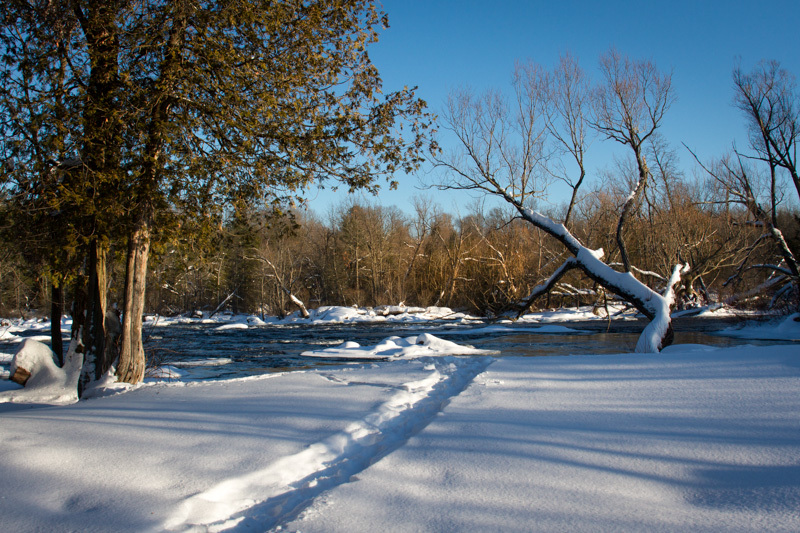 Once inside the conservation area, Sue and I merely followed the tracks that others had laid. I felt as though this tree was welcoming us with open arms. Eventually it was time to get back in the car and head home after a satisfying outing. Yahoo!! What a fun day!!! JJ was at daycare, but we enjoyed a delightful day with Danica. We played school in the morning, and I must say the kid continues to amaze me. But I'll let Sue post more on that in another day or two. We went tobogganing in the afternoon. We didn't stay for a long time, but we had a very good time as you will see, if you so choose, in the three minute clip below. The first 20 seconds or so comprise various clips of us pulling the toboggan uphill, but it was all downhill after that. What fun! You shoulda bin dere. We were back to babysitting yesterday — both of them. We wanted to get them out for awhile, but it was cold and windy, so we didn't stay very long. They did do some sledding from the snow pile on our front lawn before we gave up and went back inside for hot chocolate.